I can't actually get it into the brown room right now because there is a bunch of stuff in there in preparation for another huge project I am getting started. Can I start a few more projects, ya think? I guess I like to tear my hair out on a daily basis. Anyhow, I just love this thing. I don't think it's an option to leave it as-is, even though I do like the way it looks already. There are a lot of dings, deep scratches, weird gummy spots and paint transfers. Goof off doesn't seem to get any of it off, either. Way to live up to your name, Goof Off! Don't you just love those cute little legs? Shaun is 100% against sanding it down and restaining. I'm still not entirely sure it would work, I had about two seconds to take these pics before work today and haven't determined whether it is wood, veneer, laminate, etc. Shaun and I both know what a pain it is to sand an entire piece down to the bare wood. So does Kasey, as you may have already heard! But I don't really want to lose the cool swirls, markings and grain on it by simply painting, either. The people on Apartment Therapy swear by it, and if the existing finish can look fab after all, maybe I will keep it as-is! Oh, it's a beauty, Sara! Those gams are to die for! If you're still on the fence about the restoration, try living with it as is for a few weeks...or months. I'm sure Shaun will change his tune. I just spoke with a carpenter friend of mine about all of the things I did wrong and he agreed to help me out with the table this weekend. 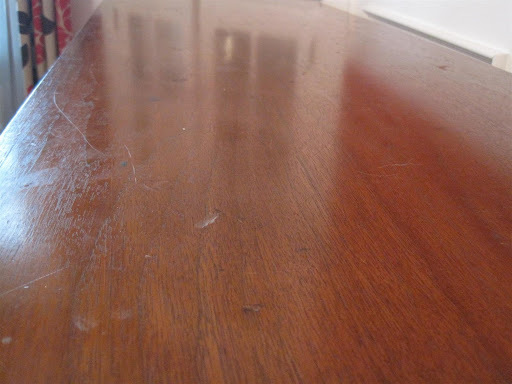 I hope I'll be able to encourage staining as of next week... either way, I hope that you can take the easy way out and use that Restor-A-Finish stuff!! I still can't get over your amazing find! 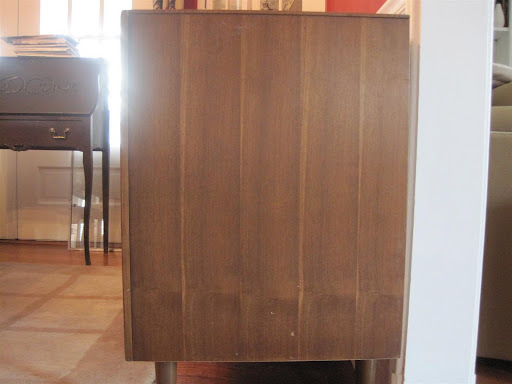 Maybe I don't spend enough time on C-List, but I only seem to find mid century scores like yours for hundreds of bucks. I'm still amazed at your $42 steal. It's going to be amazing once you've finished.....definitely go with the Restor-A-Finish first and let us know how it turns out. 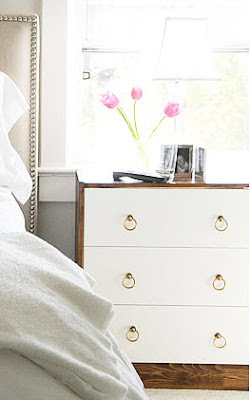 I do like the two toned look as well, but don't you just love the pure look of wood stained furniture (no paint!)??? 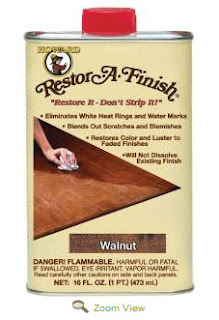 Sara you are going to die over how good "Restor-A-Finish" works. 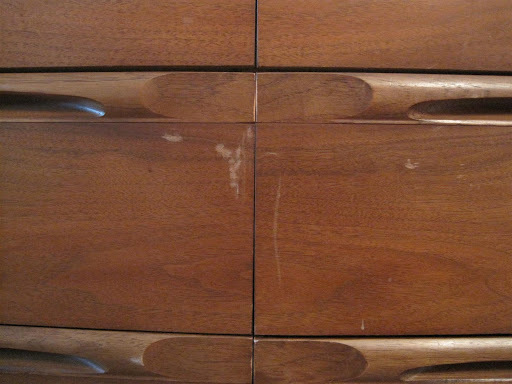 I have an antique dresser of my Grandmothers that came over on a boat from Germany with her. 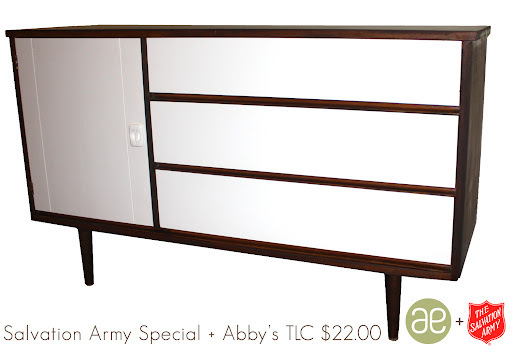 It is beautiful and has hand painted rosettes on the mirror frame and one drawer. Well, a few years back it got pretty banged up (water damage to the top and a HUGE scrape down the front). I was determined that the only way to fix it was sanding and re-staining. Well...I had this stuff I had bought for some scratches in our wood floor (recommended by Home Depot) and tried it on the dresser. I just about fell on the floor with how much better it looked. Not only did it fix all the obvious flaws, but all the other small imperfections just disappeared. Good luck! WOW-OH-WOW-OH-WOW! This is awesome! You know all my life I've grown up with antiques in my life. My mother refinished furniture and trunks and my father did antique clocks. I have gotten a lot of both from them over the years and I love the mix of old and new. Truth be told though my heart sings when I see pieces that were considered new when I was a kid (via the 70's) anything from the 50's, 60's and 70's make me smile! I love this thing and I can't wait to see how you use it and what you do to it. yay!!! don't you just love it when cl finds work out? 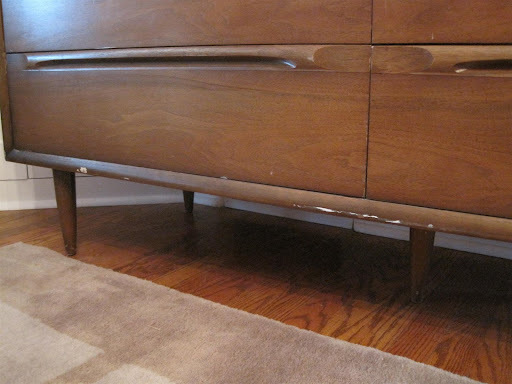 i am a huge fan of the restor-a-finish. we've been using it on our woodwork and doors and it makes a huge difference. hope you also have great luck with it! oooh, that's a good idea. i really do like the grain the way it is if you can rescue it. i've never used that, so i'm curious to see how it turns out. i want it to work! I'd definitely vote to restore it! I have to admit that I just haven't gotten into the two tone look. But either way, I know that you'll make it fabulous! What a great dresser! Whatever you decide to do, I'm sure it will look great. Have you seen the 2 tone one that Young House Love did? what a great find! I hope you'll post after photos! The two tone could be neat in the room against the dark walls! But it does have a great finish on it! Those little legs are too cute for words! What a great piece! We had something similar in my house growing up. Oh I hope the restorer works! 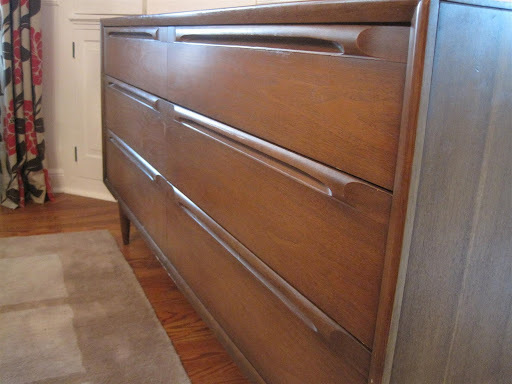 I used to have a small antique business and Restor-A-Finish really does work. It's not what I would use on anything really good, but as a quick fix-it-up it's perfect! Also, try using Goo Gone, as opposed to Goof Off to get rid of the sticky crap. It should work for you. Alternately, you could just yell at the guck. I have a surprisingly high success rate with that technique. Fabulous find!! What a gem! 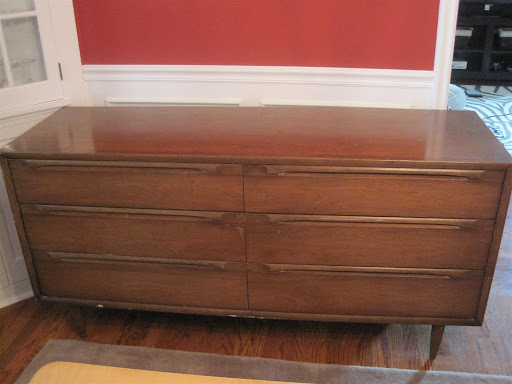 I say restore the wood look and this piece will sing even more w/ its beauty.